What meaningful gift do you give to a 90-year-old? I just wanted to tell you all that this weekend I gave my Grandmother her 90th birthday gift – a NYT from May 14th 1923. 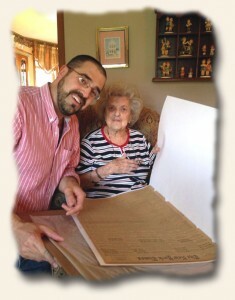 Attached are two pictures.She was thrilled with the gift and my family was as well. Discussions are already underway over which great grandchild will inherit the paper :). I’m not a collector, so I have no idea what the paper is worth, but I couldn’t believe the paper was only $42. No one really knew what to expect – some people told me ‘You know it’s just going to be a reproduction that looks old’ or ‘Don’t be surprised if it’s just the front page’, well – they were wrong. I’ve already suggested this gift idea to several friends and will continue to recommend your service, I’m sure at some time in the future I’ll need a gift this unique again. Thanks again! Original newspapers for the “Day You Were Born” do make wonderful gifts.